You can reveal this card in your hand; your opponent randomly chooses 1 card from your entire hand, then you discard the chosen card. Then, if the discarded card was not “Danger! Dogman!”, Special Summon 1 “Danger! Dogman!” from your hand, and if you do, draw 1 card. If this card is discarded: You can have all face-up monsters your opponent currently controls lose 1000 ATK until the end of this turn. You can only use this effect of “Danger! Dogman!” once per turn. Dogman inherits all the Danger archetype monster effects, which are all good. Special Summon and a card to replace the card Dogman you just summoned is good. 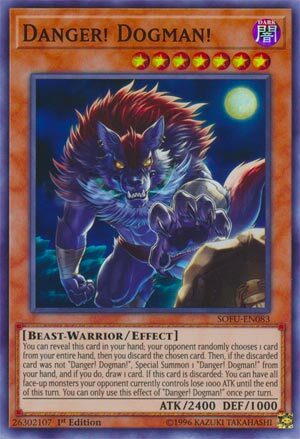 When discarded, Dogman will perform a one-turn Knightmare Mermaid and drop your opponents monsters ATK by 1000. Initially this effect focuses on the raw damage output Danger can do in a turn. Your opponent overextends during the previous turn and Dogman gets discarded, all their monsters suddenly look less formidable. If this had an effect-negating bonus as well this card would be amazing. As is, Dogman will lower the opponents monsters ATK potentially to low enough levels where smaller hitters like Jackalope and Tsuchinoko could destroy them. Dogman can be good in a pinch, or for just pushing for extra damage. It would help as well if Dogman would have been another Level 8 to go with the ones already in the Danger/Dark World archetype. We knida went over all the potential good cards for Throwback Thursday when it comes to Danger! so I guess we will look at one of the new cards again, Danger! Dogman! Dogman! is a Level 7 DARK Beast-Warrior with 2400 ATK and 1000 DEF. The stats are Monarch stats if for some reason you want to try Danger! Monarchs, but they are kinda lackluster on a Level 7, especially DEF. Beast-Warriors are better as Level 4 or lower, especially since Zoodiac Broadbull is banned so he can’t search Dogman! for a while, and you know my stance on DARK. Being Level 7 gives you two options in Danger! for Galaxy Tomahawk, so that is nice. Dogman! has the standard Danger! effect, but when it is discarded, you can debuff all your opponent’s monsters by 1000 ATK until the end of this turn. Well when an archetype gets so many monsters, you are bound to get lackluster effects on some of them. Think about some of the best archetypes ever and there is likely some weak cards in them. Dogman! is nice to have a debuff option, but the other Danger! monsters help circulate advantage where as Dogman! here doesn’t, but Konami was bound to run out of effects like that. Dogman! might be a one of if you are playing a ton more Danger! monsters in your deck so you can have another Level 7 for Number 42, but otherwise you can pass on this one. Art: 4.25/5 Wasn’t really one for Werewolves to be honest, I assume this is a Werewolf and not some other cryptid. Halloween is over now, and Throwback Thursday is still a new card in the Danger! Theme, but today, we look at Danger! Dogman!. 2400 attack is good (not as good on a Level 7 Monster, nor is that 1000 defense) but we’re still loving Dark (Beast-Warrior, in this instance). So we’re hoping the effects department makes up for a bit of paltry stats on a higher level Monster. In addition to the standard Danger! text you’ve come to know, Dogman! is rather simplistic, and does something a little different. Instead of a Draw or destruction, or a Special Summon when discarded, you can discard this to have all Monsters your opponent controls lose 1000 attack for the duration of the current turn. This is certainly a combo card. Which is a bit strange in how it goes about being one. 1000 attack drop across the board for the opponent is nothing to scoff at, but Danger! has so many big hitters, I feel like that wasn’t the most necessary of effects. I see Dogman! as a good card, but one you’re more likely to (I would think obviously) want to discard, as with only the 2400 attack, the stronger guys get the attacking done better. Art: 5/5 Halloween is over, but the feel is real in the eyes of the demon dog there, no?